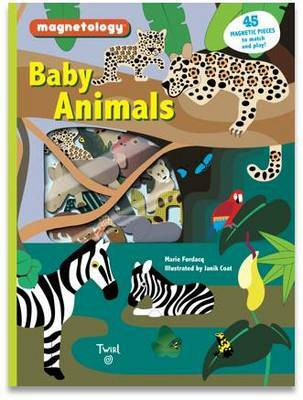 Little ones will enjoy using this adorable book with 45 magnetic play pieces to match various baby animals to their parents, all while learning about the habitats in which each animal lives. A helpful spread at the back of the book even allows tots to confirm they've placed all the babies right where they belong! And when playtime is over, the magnetic pieces can be neatly stored away in the book's handy front pocket. It all adds up to one irresistible, travelfriendly package that's perfect for any child who is endlessly curious about baby animals.